Unfortunately time constraints (i.e my day job) keep getting in the way of me updating this site so all Ive been able to do so far for the Preston North End Nickname page is a very basic bit of background. 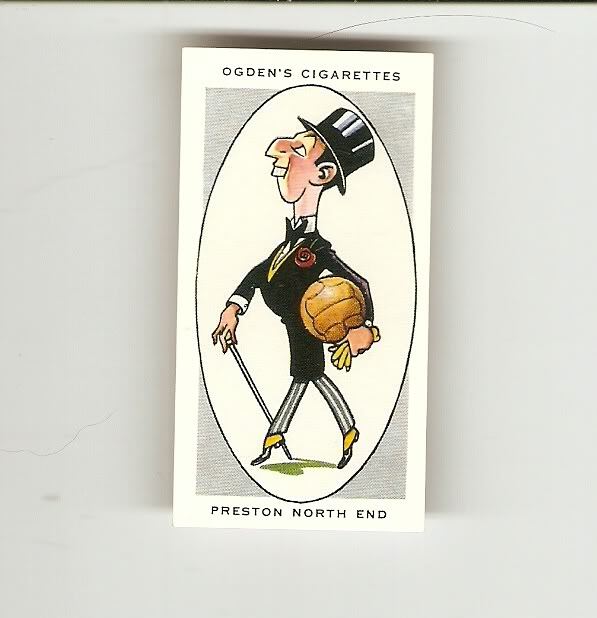 Ive shown below a football cigarette card from the Ogdens AFC Nicknames series that shows a caricature that depicts a "Proud Man", which of course is a play on one of Prestons older nicknames - Proud Preston. "Starting as a cricket club in 1862 and afterwards playing Rugby, Preston North End adopted Soccer in 1880 and were the pioneers of professionalism. At this time they obtained some of the most famous Scottish players who crossed the border, and they at once became famous, being know as “Proud Preston” and also as the “Invincibles”. The latter name was given them when in 1889 they carried off both the League Championship and the Cup, a feat which has since been equalled only by Aston Villa. In winning the Cup in 1889 the North End did not lose a goal in any of their ties". So, thats all Ive done so far but with a few nicknames to sort out - The Lilywhites, Proud Preston and The Invincibles Ill defintely be coming back to this page to expand on this particular football teams nicknames a bit more ! !